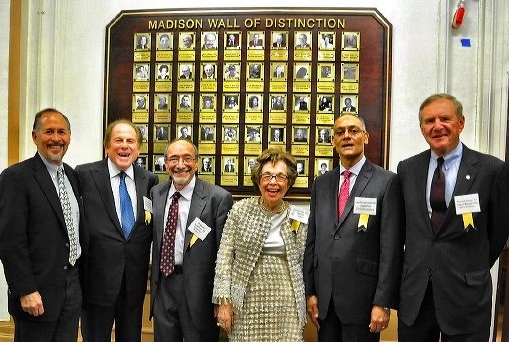 The James Madison Alumni Association inaugurated the Wall of Distinction in 2001 to honor Madisonians who have made an impact on our society. Every two years we elect several outstanding alumni and install plaques inscribed with their picture, class, and area of expertise on the Wall, located at the entrance to the auditorium. At a Sunday afternoon program, the inductees speak about their days at Madison, and teachers and friends who influenced their lives are remembered with great poignancy. It has also become a social event, as alums connect with old classmates and former teachers. This event has continued to grow, with about 450 attending in 2010. In addition to honoring the school and its alumni, the Wall has also become a popular attraction for both Madison students and visitors. Please feel free to download the Wall Nomination Form to nominate alumni who are accomplished in their fields and serve as prime representatives of the success of James Madison High School. Below are the Madisonians elected to the Wall. Bruce Morrow '53 Radio Personality "Cousin Brucie"
Judith Blum Sheindlin '60 Judge/TV Personality "Judge Judy"
Martin Sherwin, Arnold Kopelson, Steve Goldfinger, Sybil Shainwald, Barry Cozier, Ron Carner.